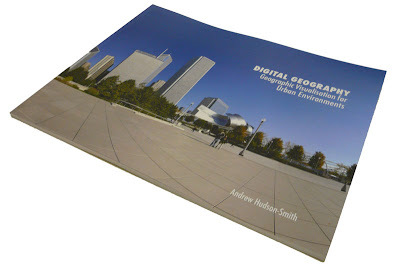 Our booklet: Digital Geography – Geographic Visualisation for Urban Environments has just come back from the printers and its looking good (even if we do say so ourselves). Printed in full colour the 10 x 8 inch booklets runs to 64 pages of insights and tutorials on Virtual Earth, Google Earth, Google Maps, Panoramas and Second Life. With a focus on Neogeography, Web 2.0 and the emerging techniques for urban visualisation it has been written as a taster of the forthcoming Digital Urban book to be published fourth quarter of 2008. The booklet should be available to purchase at the below cost price of £9.99 from this blog next Wednesday 26th March (ie after the Easter Closure). Supply is limited so feel free to drop us a email in advance if you would like a copy reserved, world wide postage will be free. I’d like to get it. I would like to get one, too. Consider it reserved – if you cant email us then feel free to leave a comment here and we will be in touch soon as the payment system is online (prob Wednesday). Can I ask whats in it, all i see is a picture, can you show some more of it please. Hi, I’m in Italy. How can i receive a copy?